Football Shape Address Plaque - - personalized football shape one line address number sign is 11" long per NFL regulations. Made in USA. Address plaque in the shape of a football is perfect for all football fans, players, parents, and coaches. Holds three (3) 3" characters, two (2) 3.5" characters or one (1) 4" character. Eight vivid color combinations shown in swatch chart above: sky blue with white characters; black with white characters; white with black characters; brushed gold with black characters; brushed stainless with black characters; kelley green with white characters; red with white characters; and yellow with black characters. Characters and border are permanently engraved into the sign during the production process, not painted or printed on. Border, stitching, and ball accent lines will be same color as character color. Dimensions: 11"W x 7"H x 1/8". 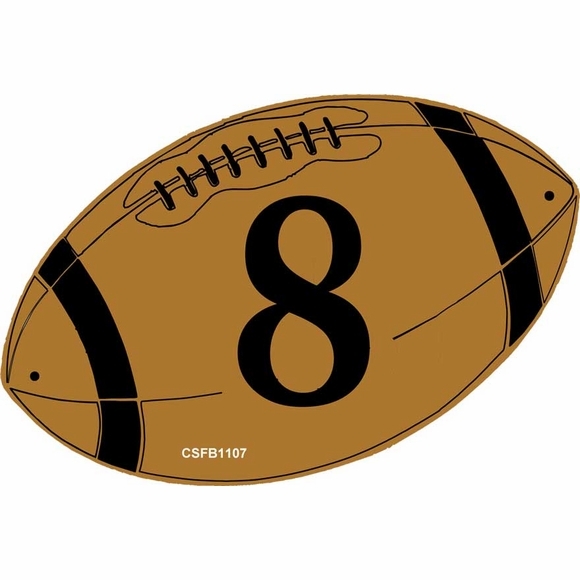 Comfort House exclusive laminated acrylic football shape house number sign. Crafted in the USA by skilled artisans to assure the highest quality. Football not big enough to hold all the characters in your address or name? No problem. We may be able to supply this sign to meet your requirements. Please contact customer service with your specifications for a quotation (customerservice@comforthouse.com).